A shocking incident took place in a charity match in Brazil when a so-called ‘fan’ ran onto the pitch and attacked Gabriel Jesus. 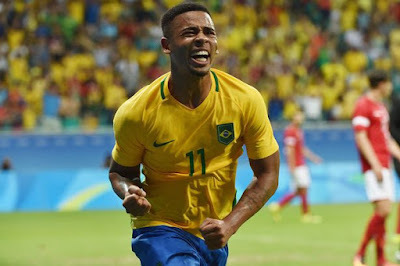 It occurred during the game between the Amigos do Jackson and Amigos do Valdiva in Brazil on Wednesday evening. The incoming Manchester City star was unsuspecting to the pitch invader, who tackled from behind. His lunge left Jesus on the ground in a heap. He eventually got up and was alright. The pitch invader was escorted off with one or two players following to presumably have stern words with the culprit. It’s a senseless act of violence. Even though this was quite a minor incident, the fact that he was able to get up close with the players is worrying. If he was slightly unhinged, it could have been much more serious. 21-year-old Jesus will join up with the City squad after he has had a break following the domestic Brazilian season. The £27 million summer signing stayed in Brazil to help Palmeiras win the league for the first time in over 20 years.